Last week, the City Council held its first hearing to start hashing through the details of the three written contracts that will guide OVG’s renovation and operation of Key Arena. The three “transaction agreements” are the Development Agreement, the Lease Agreement, and the Integration Agreement. They are all based on the high-level details laid out in the MOU that the city signed with OVG last December. The Development Agreement relates to the demolition and renovation of the Arena; the Lease Agreement handles lease and operation of the Arena once the renovation is done and it reopens for business; and the Integration Agreement lays out how OVG will cooperate with Seattle Center, neighboring tenants on the campus, and neighborhood organizations. Collectively, they are about 325 pages. By my own reading, and that of the Council’s staff as they related this morning, they are consistent with the terms of the MOU; I couldn’t find any significant departure, and in briefing the Council this morning city staff presented a briefing packet that walked through how key MOU terms were implemented in the transaction documents. In particular, they provided a “crosswalk document” that shows how the numerous community benefits listed in the MOU show up in the transaction documents. That said, the devil is in the details, and there are several notable provisions across the three agreements worth highlighting. - OVG may not host events primarily for the sale or use of marijuana or marijuana-related products. - The city has the right to audit OVG’s financial records to ensure compliance with various aspects of the financial arrangements in the deal. - OVG is responsible for all utility costs at the Arena. - After the initial renovation, the city must approve all material alterations to the Arena. - OVG must submit an annual update to its ongoing capital improvement plan. - OVG must provide meeting space for the Uptown Alliance and the Uptown Arts and Culture Coalition. - If the building is damaged during the term of the lease and it would take longer than 24 months to repair it to the point where the building can reopen, OVG can terminate the lease immediately upon providing financial resources sufficient to fully repair the building. OVG is also required to provide proof that it has adequate insurance to cover damage to the building. - Any transfer of OVG’s rights under the lease to a third party requires the approval of the city. - Any NHL and NBA teams signed to play in the Arena must sign non-relocation agreements with the city, guaranteeing that they play the vast majority of their “home” games at the arena and that their team headquarters is in Seattle. Teams may host their training facilities outside of the city, however, and their staff and players are not required to live in Seattle. - The city is responsible for the cost of relocating the Seattle Storm for their 2019 and 2020 seasons. OVG is required to offer a contract to the Storm, starting with their 2021 season, no later than October 1, 2020. The Storm recently announced that they will play their 2019 season at UW’s arena. - OVG can encumber its lease rights through its financing deals. If OVG were to default on its loans, the note holder can take control of the arena as part of foreclosing on the leaseholder rights. The note holder can fully assume the role of tenant in place of OVG, and has the right to negotiate a new contract with the city. - OVG is required to maintain safe pedestrian access during the construction phase. - OVG has a goal of 15% of the subcontractors being women and minority owned businesses, with an aspirational goal of 18%. Likewise, the workforce will be 18% apprentices. - OVG is responsible for all cost overruns on the project. To ensure that any overruns don’t exceed OVG’s financial resources, OVG is required to bid out the project as a “Guaranteed Maximum Price” contract. - Any material changes to the final design must be approved by the Director of the Seattle Center. - OVG will pay $1.5 million toward the relocation of the skate park, the maintenance facility, and other nearby facilities, and $250,000 toward relocation of other tenants. 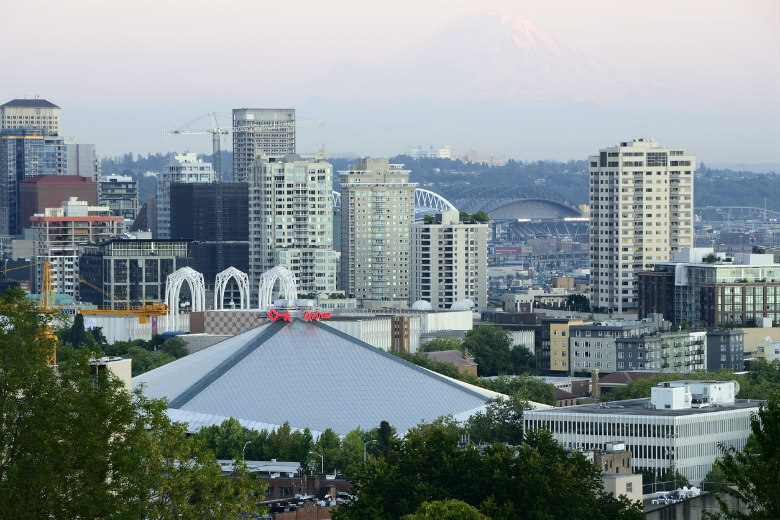 - OVG and Seattle Center will investigate implementing shared IT systems for parking, ticketing, and event booking. Seattle Center shall give ArenaCo prompt notice if Seattle Center provides a permit or license for a Protected Speech event on the Seattle Center Campus. As a result of the possessory rights granted to ArenaCo pursuant to the Lease Agreement, Seattle Center shall not have the right to provide a permit or license for a Protected Speech event on the Premises except with respect to vacated Second Avenue North and those portions of the Premises located in the Northwest Rooms Courtyards to which the City, as landlord, has Reserved Rights which are consistent with such license. Nothing in this Agreement designates the Premises as a public forum of any kind and nothing in the Agreement is intended to create any public right to conduct Protected Speech events or activities on the Premises. Also, OVG can bill back to the city for any “damage or excessive cleanup” attributed to a free-speech event that the city permitted. - All persons entering the arena — including staff — will be subject to walk-through metal detectors. - OVG will be the exclusive representative for sponsorship benefits at Seattle Center — not just the Arena. One surprise revealed in the hearing this morning is that OVG will not be allowed to begin demolition (currently scheduled for December) until it has a signed agreement with the NHL for an expansion hockey team. This is a departure from the original plan, in which OVG argued that it had a sound business plan for the Arena even without an NBA or NHL team. The argument for this requirement: the city has been advised that it should ensure OVG has sufficient financial resources for the renovation project that it can readily draw upon before construction begins, and having an NHL contract in hand makes it easier for OVG to secure funding. The city is also asking the City Council to consider a change to the allowed uses for admissions tax revenues so that those funds can also be used for sports and music purposes; currently they can only be used for arts and cultural purposes. The change would allow the city to use admissions tax revenues to fulfill its financial obligations under the transaction agreements. If the Council doesn’t approve the change, it’s not a deal-breaker; it just means that general fund dollars, which are more flexible, must be used to cover those needs. The Select Committee on Civic Arenas is scheduled to meet again next Friday, at which it is expected to vote on any amendments to the agreements and vote the agreements out of committee. The full Council would then vote on final approval of the agreements on September 24. The Council members are likely to suggest changes to the transportation mitigation provisions, and the community benefits provisions. In the meantime, the deadline for filing an appeal of the final Environmental Impact Statement (FEIS) on the arena project is September 13. Any appeals (which are likely) may push the project schedule out further.